Sugar was a gorgeous little baby, always busy and into everything. I was so pleased with the litter from Dee Dee and Cooper and had a very hard time making my final choice for a keeper. 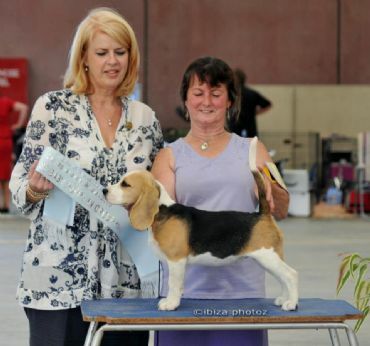 As a "veteran" of the show ring now, Sugar has won 6 Baby Puppy in Groups, 1 Baby Puppy in Show (at all breeds Champ Shows) and a Baby Puppy in Group at an all breeds open show. Several judges have asked about her breeding and commented on her lovely forechest, upper arms and shoulders, hind quarters, neck and feminine head. One lady judge even admired her beautiful "eyeliner" and said she was quite envious! I adore this spunky little girl, she is a very fast learner, always near me to see what I am doing, and always ready to join in with fun and games. She is a terror at home at times, chewing her way through a number of books and DVDs, but I still love her. After a break of some 6 weeks or more from the show ring, due to other babies at home, Sugar has now returned to the ring as a Minor. 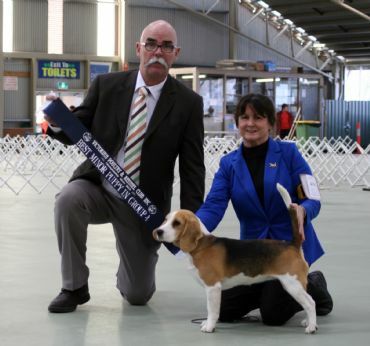 She won her first challenge on 7th June 2013, so is now on her way to a title. Looking forward to seeing how she matures and develops! 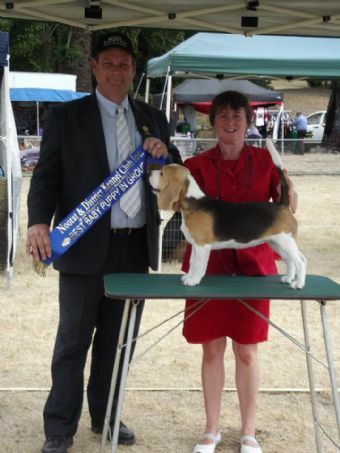 6th July 2013 saw her 2nd challenge and a Minor in Group under breed specialist judge, Mr Ken Rampant (NSW). Not bad for a girl who had a bad fright several weeks ago and didn't want any part of going inside at KCC Park, or the judging table, or the judges touching her. Thanks to a wonderful friend who suggested trying some herbal tablets, she is back on track!